When Captains Meriweather Lewis' and William Clark's Corps of Discovery neared the Mandan villages on their return trip in 1806, most of the men were good and ready for the comforts of home. Not John Colter. When two trappers headed up the Missouri invited him to join them, he accepted and received his discharge. John Colter was the prototypical mountain man. By 1806, he had already crossed the continent twice with Lewis and Clark, gaining valuable experience in the rigors of wilderness life. Colter was also not a stranger to dealing with the Indians; he had been involved in Captain Lewis' conflict with the Blackfeet on the return trip from the Pacific. In 1807, Colter joined Manuel Lisa's newly formed Missouri Fur Company on an expedition to the Rocky Mountains. The party was successful in getting up the Missouri and establishing Fort Raymond. That winter, Lisa sent Colter out to all the winter Indian camps to alert them of his presence and desire to trade. Alone, with only his rifle and a 30lb pack, Colter traveled an estimated 500 miles that winter with the help of Indian guides. His route has been disputed, but general consensus is that he was the first white man to see Jackson's Hole and Yellowstone Lake. He also saw part of the thermal wonders of Yellowstone and through the tales he told it would come to be called "Colter's Hell." The next year, while trapping beaver he and a partner were attacked by Blackfeet Indians. The attackers swarmed on Colter, stripping him naked and taking all his possessions. They killed his partner and Colter awaited his own execution. To his puzzlement, they set him free and told him to run. He took off and soon realized this was a game of "human hunt". After running a couple of miles, Colter turned around and killed the only Indian that was close with his own spear. He stole his blanket and continued to run until he came to a river. By hiding in the river under a pile of logs, Colter was able to evade his pursuers. He walked the 200 miles back to Fort Raymond with only a blanket for warmth and bark and roots to eat. After eleven days, he stumbled into the stockade, more dead than alive. The Blackfeet would not leave Colter alone, however, and eventually they would drive him to leave the mountains for good. After gaining strength at Fort Raymond, he returned to the site of the attack to retrieve the traps he had thrown in the river. Again he was attacked, but this time he escaped unscathed. Shaken, but not ready to give up his exciting and dangerous life, Colter signed on to lead another Missouri Fur Company party in 1810. True to past experience, the group was attacked by the Blackfeet and Colter finally vowed to leave the west. He did just that, using his fur trade profits to buy a plot of land in Missouri and build a cabin. There he married a woman remembered by history simply as "Sally" and had a son. It was jaundice, not the Blackfeet that killed John Colter in 1813. Colter left no records of his journeys, what we do know about him came from the random writings of others. He also left no map of his own, but he did have a conversation with his former leader, William Clark, in 1810. 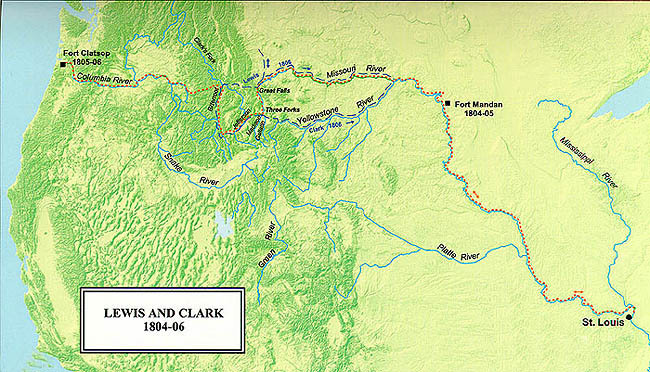 It is assumed Colter told Clark of the things he had seen in his years of travel as a trapper, as the map that appeared in Nicholas Biddle's 1814 version of the Lewis and Clark journals reflects Colter's knowledge.